As developers build three new homeless shelters, some state leaders are asking: Will they be enough? 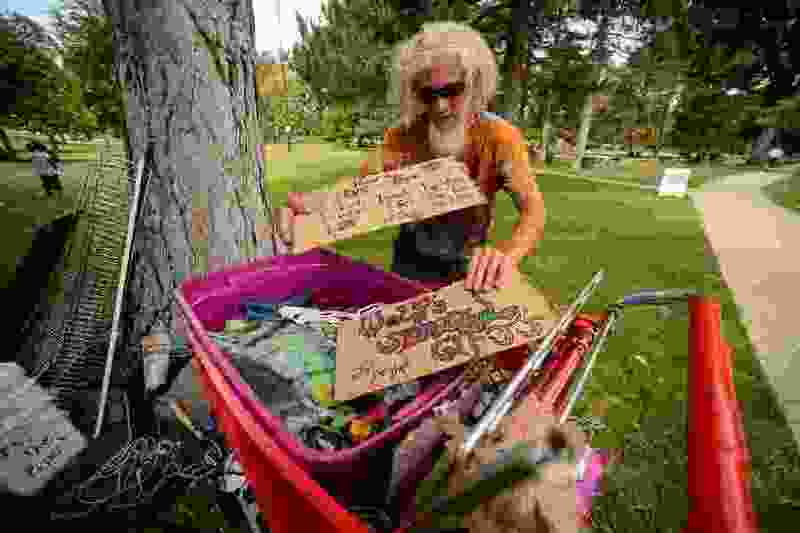 (Trent Nelson | The Salt Lake Tribune) Wolf, who is homeless, sets up a stand to sell tie-dye t-shirts in Salt Lake City's Liberty Park, Wednesday July 11, 2018. Wolf prefers to camp in various places around the city rather than stay in one of the available shelters because of drugs and other problems associated with those facilities. In less than a year, Utah plans to close the big homeless shelter in downtown Salt Lake City known as The Road Home and replace it with three smaller ones. But even as crews construct those new shelters on land picked following much controversy, state leaders are trying to determine if they’ll need more. A small group has been meeting in recent months to discuss whether the state’s current three-shelter plan will serve all of the people in need of a home, shelter or other services as the June 30, 2019, construction deadline nears. “We’re saying: ‘Is there a need for another kind of a shelter for those who have these long-term needs?’” said Pamela Atkinson, a well-known advocate who works closely with state, local and nonprofit officials on homelessness issues. Atkinson said the conversations have been ongoing since February. The group is surveying homeless people who don’t stay at The Road Home to see why they prefer sleeping outside. It will deliver its findings and any recommendations to the state committee that oversees funding for homeless services in August. At a recent meeting on homelessness, Atkinson said the work included “the possibility of coming up with a shelter, a long-term care shelter, that would be outside of Rio Grande” and could house possibly hundreds of people. The survey will help determine how many people will likely not be a good fit for the new shelters, which are intended to be all-inclusive, helping people navigate government programs and find a job. During a recent cleanup at a homeless camp off Victory Road on the north end of the city, several residents who were clearing out said they avoided The Road Home because of safety concerns. On Wednesday, a man who goes by the nickname Wolf and his friend Shane Thompson said they don’t want to go to the shelter because of concerns about bedbugs and drugs. A recent legislative audit found evidence of widespread drug use at the shelter, and it found more people avoided the shelter for similar reasons. The Road Home has worked to improve security with an eye on keeping out drugs and weapons. On Wednesday, it announced it began using a new metal detector at check-in. 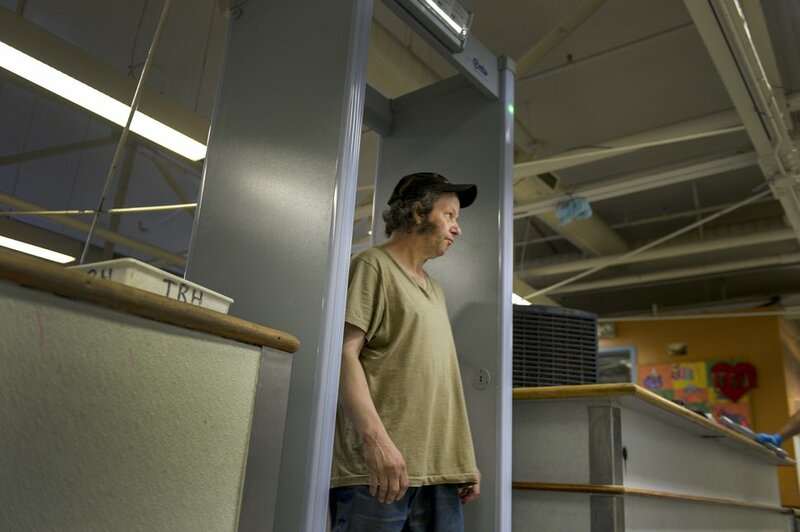 Leah Hogsten | The Salt Lake Tribune James passes through a metal detector prior to entering the shelter, July 11, 2018. The Road Home has implemented new security measures at the downtown emergency shelter. New policies and procedures include the use of metal detectors and property searches during check in, managing entrances and exits and incident response system to ensure safety. It’s too soon to say how many people who avoid the shelter are looking for a different type of housing, whether that housing is available and what needs to be developed to serve that population. Data show that Utah’s housing market is becoming increasingly unaffordable, and that may push some to the brink of homelessness. Providers say it’s clear there’s a shortage of affordable housing for low-income residents. When a nonprofit redeveloped a motel on State Street into dozens of low-income units, the rooms filled within weeks. Preston Cochrane, executive director of Shelter the Homeless, which is coordinating development of the new shelters, said the survey of homeless people will also look at the need to serve “those really chronically, chronically homeless,” including those with severe substance abuse or mental disorders. The survey and follow-up in August will determine whether the state, county and city maintain an emergency shelter separate from the three new shelters being built. There is a Midvale shelter for families that will remain open as well. “We’re going to need some space for an emergency [shelter] and, hopefully, we don’t need as big a space as The Road Home is,” said Jean Hill, who works on homelessness issues for the Catholic Diocese of Salt Lake City. “We really need a concerted focus on the housing side of things.